Although I wrote everything I know about squirrel issues for this website, oftentimes a problem with squirrels in the attic is beyond the scope of the do-it-yourself homeowner to solve. I have found a professional company in Bridgeport, Connecticut that handles problems with wildlife. 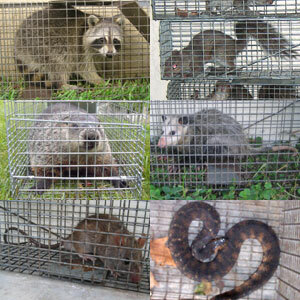 NCS Wildlife has access to tools, techniques, and experience that help them do a far better job at wildlife removal than a non-experienced homeowner could. They possess licensing that allows them to do certain types of work legally, that non-licensed homeowners in the state of Connecticut are not allowed to do. For the welfare of your situation, and the squirrels, in some cases it's best to hire a pro. There are good companies and bad companies out there. I've done research on such companies, to get to know them, and feel confident recommending their services. I therefore recommend a company called NCS Wildlife which services Bridgeport, Connecticut. If you have a squirrel problem, or any other conflict with a wild animal, and live in Bridgeport, I am confident that this company, NCS Wildlife, is the one to call. I asked the company to describe their service range, and they said this - We service the following towns, Greenwich, Stamford, Darien, New Canaan, Wilton, Norwalk, Westport, Weston, Easton, Fairfield, Trumbull, Bridgeport, Stratford, Monroe and Milford. NCS Wildlife operates 24/7, so don't hesitate to call at any time to discuss your wildlife problem, and schedule an appointment for same-day or next-day service. David, we have just discovered a Flying squirrel in the house. This has happened many yrs ago and I trapped it with a swimming pool leaf net which I will do again if I can find it. It is about 9:30 pm and we saw it maybe 30 minutes ago, however, it escaped before I could capture it in my net. Now it has run under furniture and where ever and I can not seem to find him. Any suggestions? I have read all you have online. We have had flying squirrels in the attic for many years and I think we still do, and many years ago I hired a wild life Co. and he and I crawled all over the attic and in the end he gave me some sticky strips to place around. I also, a couple of years ago, found where they had been coming in. It was under and thru th turtle back vents where they had chewed thru the barbs and vent bars. I made a box out of hardware cloth and covered all of them and placed a large rock on each to hold them firmly against the roof. I thought that ended it all until tonight. A lot of time has lapsed since I started writing this. I had to catch a squirrel that had been hiding and I succeeded. However, I did not take it miles away, I just let it go outside. I know that is not what I should have done. I think I know where it might have come in, I am not sure, but I think perhaps it came down the chimney of my masonry fireplace. I have a wood burning insert in the hearth, but years ago when I did that all I did was use fiberglass insulation stuffed in between the rock and the insert frame that's up against the rock. When I was trying to catch it at one particular time it went in through the fiberglass behind the frame. I sat and waited and when I turned the lights out, it came out. I chased it all over the house and down the steps to the basement and I almost caught it but it got out of my net and went under the door. So then I chased it all over the basement until I cornered it and had my wife open the basement as I chased it towards the door and it went out. So with all of that said, if you have any suggestions, please send them. I am going to go get some more hardware cloth tomorrow and secure it over the chimney. Although I am not completely sure that's how it got in. I might have come through the exhaust vents in the bathrooms. And if it did then I know I still have them in the attic. I will just keep looking. I am sure that I may find some place i may have overlooked. I haven't told you where I live, not that that matters, but I am outside of Greenwich CT. David, Thanks for your time. Thanks for the letter. Sorry for my late reply. As you may know, the most important thing is to find out how they are getting in, and block access. It sounds like you've tried to do so. Any success? Thanks for replying David. I haven't had in intrusions inside the house as of today. However, I haven't gotten up on the roof to check the vents that I had covered with hardware cloth as yet but when the weather gets better I plan on doing that. Other than that, that's all I have done. I do realize that I have to definitely find where they are coming in. And I think I still have them in the attic. At least I think I do, we still hear things up there from time to time. And I will, just to check and see, put a couple of live traps up there again and see what I catch. I will let you know what happens. Thanks again for responding. If you have a squirrel problem in Fairfield County Connecticut, or any other conflict with a wild animal, I am confident that we can solve it. We use humane methods when dealing with Bridgeport wildlife removal situations. Squirrel Control Bridgeport. Our company is fully licensed and insured in Connecticut. Call us any time at 203-635-4650 for a price quote and to schedule a same-day or next-day appointment to solve your squirrel problem in Bridgeport.